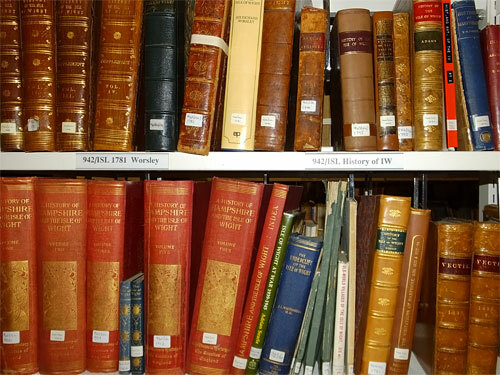 Carisbrooke Castle Museum has a significant collection of local books for the public to use. Titles began to be acquired by the Museum when it was founded by Princess Beatrice more than a century ago. The collection now comprises more than 2,500 books and leaflets, ranging in date from the 17th century to the 21st, including directories, guide-books, topographical books and publications on local history themes. There are a number of titles relating to Charles I, some of which date from the 17th century. Most of the books have been acquired as gifts, often as bequest from local collectors. Particularly noteworthy is the Guy and Zirphie Parsloe Collection. We are keen for the library to be used, and welcome researchers. Please contact the Museum should you wish to visit, and we will happily arrange a suitable time. As well as being available for reference, a good number of titles are able to be loaned at the discretion of the Curator or Librarian.